Janie writes, "I have such a special kitten that I adopted from you. He made his way into my heart long before I could take him home: Baby Taylor. I have named him, officially, Taylor J. Livingsworth, as his life is certainly worth living in style after his long road to recovery once he reached Kitty Angels' doors. Taylor has adjusted, or if I might say, just let himself in to the hearts of me and his brothers, Thaddeus Tadpole and Zig-Zag. 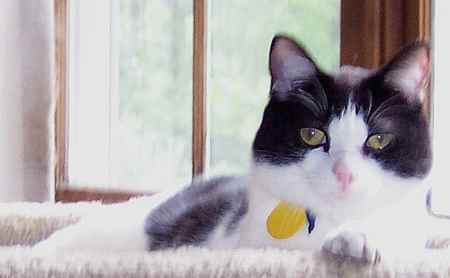 "Ziggy tended to be a spoiled cat and rather selfish, though ever so loving. However, after an hour or so with Baby Taylor, Ziggy's heart melted and Taylor was number one. He could run over Ziggy and Tadpole and use their beds. He cuddles with them, sleeps head to head, and all the fun stuff you can imagine. 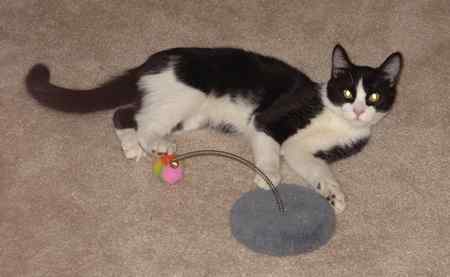 "Tadpole will be five this September but he again acts like a kitten since Taylor joined our family. I love seeing Tadpole dashing after his own tail as Taylor himself does. "Please enjoy this picture and thank you, Kitty Angels, for bringing new sunshine to me." 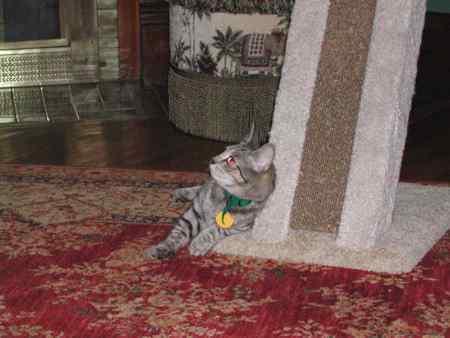 Kerrie and Chris write, "In April of 2005, we adopted a cute little kitten named, at the time, "Doobie". I must say our first meeting, Doobie and I, went just ok. I picked him up, and he swatted me in the eye. After putting him back in the little cubicle, I decided to give him some cool off time. "After several minutes, I tried again. second time wasnt so bad. After much hemming and hawing, I took him! I brought him home, but my husband wasn't so sure, having heard the story of the swat in the eye, and we were concerned for Tucker, our first cat. We decided to let them get to know each other and see how things went. "Well my goodness! Over one year later and now living in a house instead of an apartment, the two are best of friends and he is now named Bruschi. 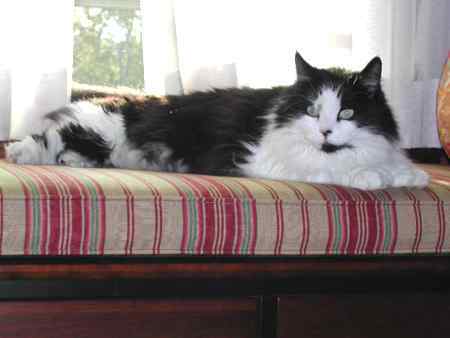 Yes for the football player, since Bruschi the cat has the same linebacker tackle as does the football player. When we got Bruschi he was five months old and weighed about 6 lbs. Today he is 18 months old and weighs in at a healthy 13 lbs. "Bruschi loves his big brother Tucker. They sleep and play together all the time. Bruschi is also the BIGGEST CUDDLE BUG EVER!!! He loves to sleep in the bed under the covers with you, and if he's lucky and has room, he'll share the pillow with you too! We love him to bits and are so glad he came home with us. "Thanks so much for all you do!" "They are both now coming out of their shell. Markus loves playing with the bird on the cat wand. Mandy can be enticed to play also. Mandy loves to be petted and have her belly rubbed and I've picked her up and held her in my arms a few times, but she's not totally ready for this. She does leave the Cat-Abode for her adventures, particularly at night, and is now coming into our TV room. "Markus still does not allow us to get close enough to him to be petted (I've only petted him twice when he was on the windowsill). He does hang around us alot now and he allows us to get about a foot or less near him before he takes off. He also like to play at night and loves windowsills. Our Molli has been great with them. She is such a friendly kitty and Markus & Mandy get along well with her. So all in all there's progress but there's still more to be done to earn their trust. But every day we can see improvements." 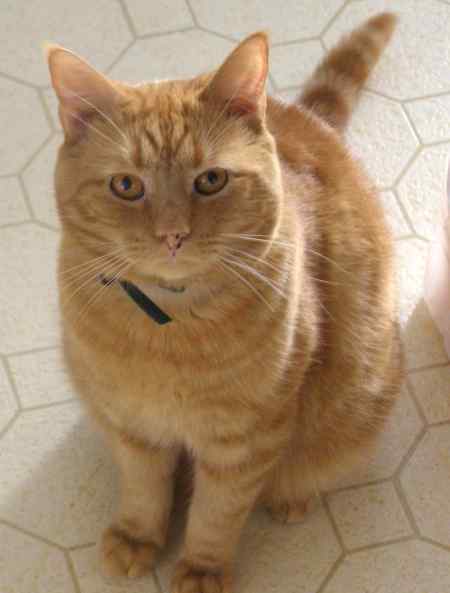 Desireé writes, "We adopted Charley in August of 2004. When we adopted him he was two years old. The first couple of weeks he hid a lot but now he follows us around wherever we go. He seems to be enjoying himself here with us. We have so much fun with him. If we throw his little ring toy he will jump up and catch it in the air and then bring it back to us and drop it at our feet to throw again. He greets us at the door when we come home at night and loves to sleep at the end of our bed or on our laps. He is a wonderful cat and we love him very much."